PowerLight Free-Space Power Beaming technology supports remote sensors, remote telecom relays and unmanned ground vehicles (UGVs). With remote sensors and remote equipment, the technology transfers power across distances where traditional hard wires are unfeasible—technically, practically or financially. The technology provides increased freedom from hard wires and the logistics of fuel, making deployment and movement infinitely easier, safer and more reliable. Free-Space Power Beaming technology produce less noise compared to generators. Unlike battery-powered platforms, the technology does not require taking assets out of service for frequent recharging or battery replacement. Contrary to other forms of wireless platforms that use low-value watts of power, Free-Space Power Beaming technology uses kilowatts of power that enable the fixed point-to-point asset to travel extremely long distances of kilometers vs. inches. Free-Space Power Beaming technology is here today, and it is safe. It powers fixed point-to-point assets while they are in motion. The PowerLight platform incorporates a virtual shield of safety that ensures the people and environment above, below and nearby remain safe. 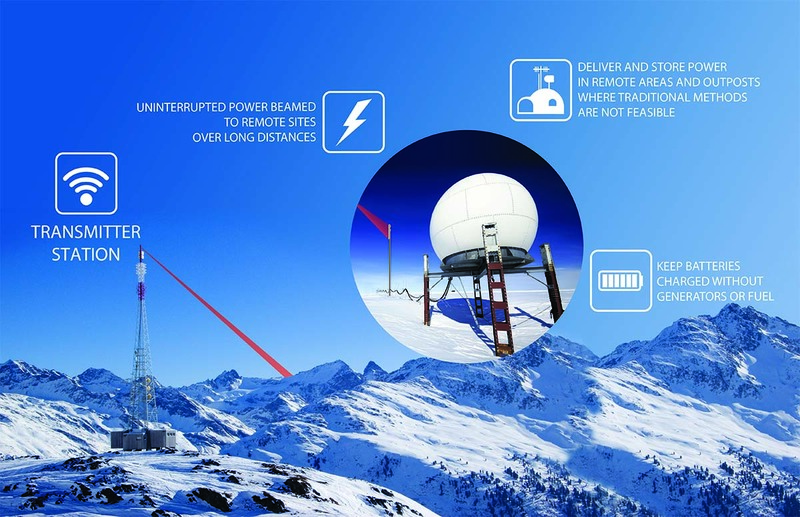 Industries that can greatly benefit from Free-Space Power Beaming technology for fixed point-to-point applications include aerospace & defense, disaster response, oil and gas, temporary construction, telecom, crane, manufacturing and those maintaining facilities with a large footprint or micro footprint in remote outposts.